Love is always the best medicine. When someone is in a rough place, a little love can go a long way. One woman was shocked at how much could change for her son just by introducing a new member into the family. Linda Hickey live in Georgia with her husband and two children. Her youngest is 8-year-old Jonny, who has been diagnosed with autism. At first it was hard for Linda to admit that her son had a disability, and it seemed difficult for him to cope with the situation. Jonny was not doing great in school. He had a hard time making friends; he actually felt very uncomfortable with anyone who wasn’t in his immediate family. He did not enjoy being in public places, even with his parents by his side. The family began to fear that the boy’s opportunities would be severely limited by his anxieties. They had adopted two dogs, but Jonny never seemed to bond with either of them. He wouldn’t pet them or play with them, and it seemed that he didn’t enjoy their company. Just when the boy’s situation looked the most bleak, something life-changing happened. Linda sat in front of the television one night, and a story came onto the news that tugged on her heart strings. A dog had been found in a critical condition and was in desperate need of help. This dog, who was named Xena, had been severely abused. She was only a puppy, but she had already been through so much. 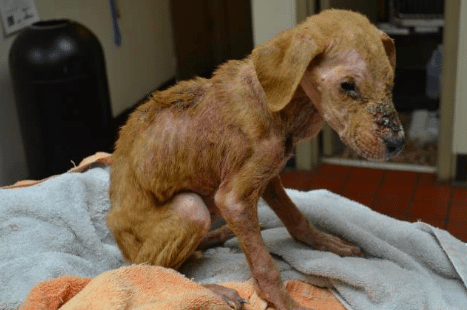 By the time she was rescued by the Dekalb County Animal Services there was a chance that she would not survive. 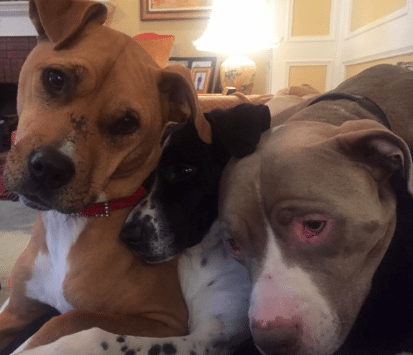 “I’ve been doing rescue probably for about 12 years, and I had never seen a dog that young in that sort of condition,” said Chrissy Kaczynski, who worked with the rescue shelter. Xena’s situation was truly heartbreaking. Linda felt an immediate connection to this dog. 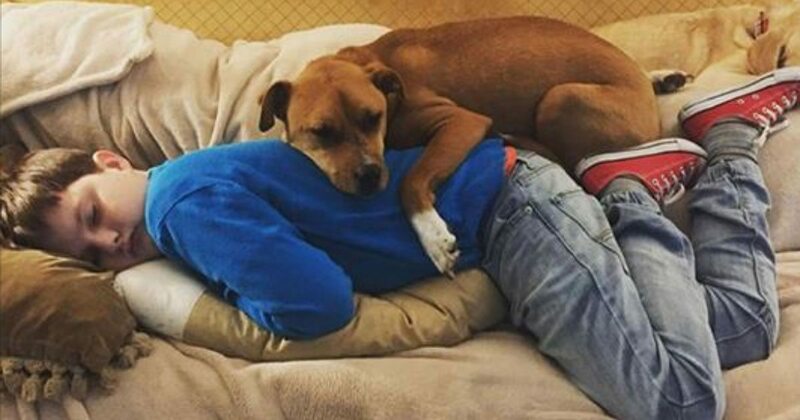 She made it a part of her routine to check on the shelter’s Facebook page each morning to see if the dog had survived the night. 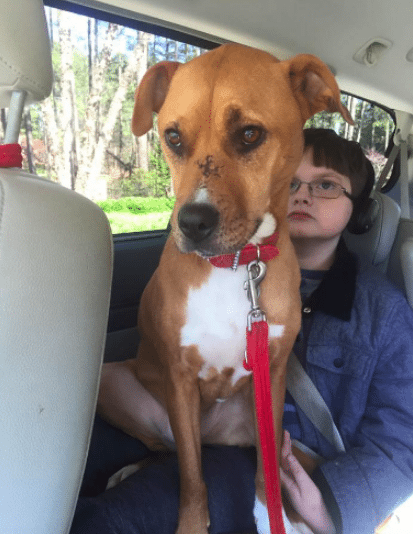 As she followed the story of this brave pup, she slowly realized that she wanted Xena to become a member of her own family. Linda got into contact with Chrissy, who decided Xena would be an excellent fit for the family. One day Chrissy brought the dog over for a trial period. 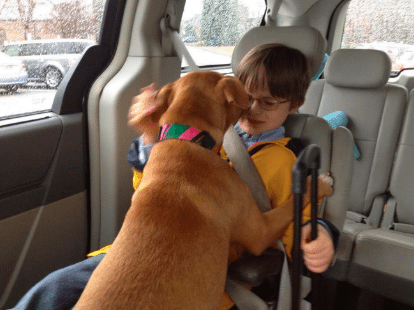 The plan was for the pup to spend the night so that the family could see how she would get along in her new home. The result was better than anyone could have imagined. Linda and Grant didn’t tell their children about their new plan. Instead, Xena rode in the car with Linda on her way to pick the kids up from school. She would be a surprise for Johnny and his brother, but no one knew quite what to expect. From the moment Jonny saw this dog he had a huge smile on his face. The two bonded instantly, and he let Xena lick all over his face. From that moment on, everything changed. Suddenly Jonny was happy all the time, and he had no trouble interacting with people. Grant recalled several occasions where the little boy took off running, only to give a stranger a hug. It was like nothing they had ever seen before. With his best friend by his side, Jonny is doing way better. He is able to interact with others without trouble, and his mood is almost always good. Even his teachers have noticed the difference. 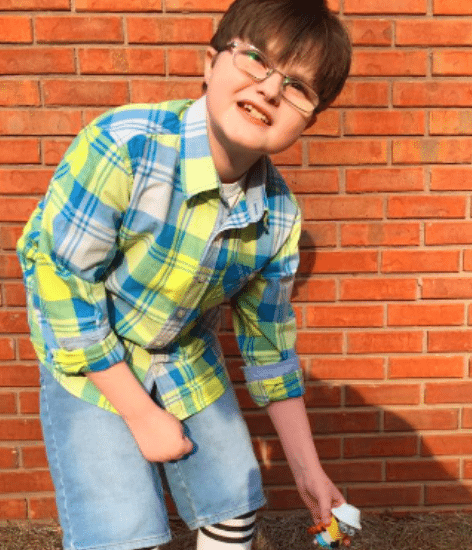 Recently Jonny won the Super Star of the Week award in his classroom – an honor that he had never received in the past. 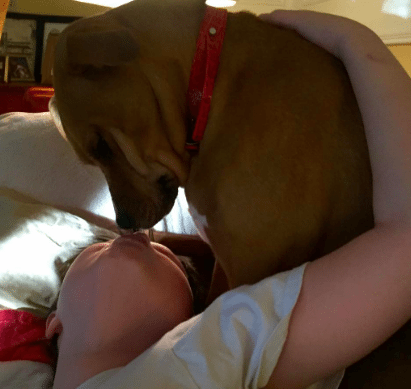 Jonny and Xena are both working miracles in each other’s lives. The two both came from total isolation, and have found unconditional love and support in each other. 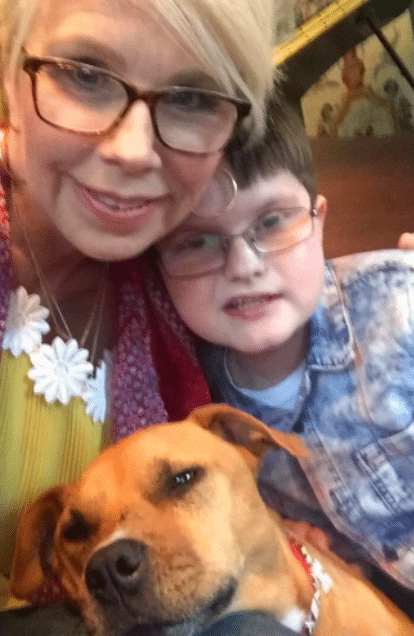 Having Xena enter Jonny’s world changed everything, and his parents are so glad for that chance night when Linda saw a helpless dog’s story on the news.